Connectivity's wireless callboxes have many cutting edge features that can benefit a variety of environments. Employing radio links, our systems combine basic, critical operating components with the latest technological developments. Our progressive design allows for effortless integration with a customer's current radio network or a system can easily be licensed. Our systems meet ADA requirements and TDD models are readily available. Foremost, Connectivity's callboxes are a cost-effective way to expand communications/security coverage to reduce response time - without adding additional personnel! Click here for the Features and Benefits of Connectivity's Wireless Callbox Systems. Our callboxes offer patented features, making them the best callbox systems available! Connectivity's wireless, solar/DC powered technology supplies up to a 60-day battery charge on just a full day of sunlight! This solar capacity provides the ability to secure even the most remote locations - without the need for expensive hardwiring! A sophisticated design allows for easy on-site programming to suit each customer's needs. Durable, weather-resistant enclosures, a modular circuit board for one-trip service, and an upgradeable microprocessor are engineered to ensure long life of service. Not only do our units offer ease of use, but they are shipped turnkey for easy installation – typically less than an hour – without any trenching! Commitment to employee and student well-being can be addressed by placing callboxes on campuses and in company parking lots. In the unfortunate case of an emergency, just opening the door on door models, or pressing the button on door less models; will enable instant, reliable and effortless notification (ID and location) to one individual or to a team of security and/or emergency personnel. Automatic audible instructions guide users step-by-step. Crystal-clear, two-way voice or voice and visual communication enables responding personal to quickly assess a user's needs. Yet even if a user is unable to verbally communicate, the automatic ID feature allows personnel to quickly converge in response to an emergency summons. Vandalism has been addressed with a tamper-alert, which will only be heard by designated staff. Input and output connectors are accessible for expansion peripherals; such as, lights, camera, motion, smoke, gas, water detection devices and gate entry. 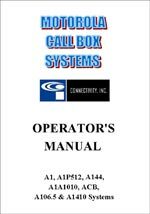 A low-battery alert and optional customizable system reporting and maintenance software ensures reliable callbox operation. Our callbox systems' portability will also allow the units to be deployed before, during and after disasters. They can be placed at the command posts of medical, fire/paramedic, security, military and emergency planning and relief agencies. Following a disaster, they can be tactically placed in remote/inaccessible areas as the critical link between people. The ability to quickly change messages to suit temporary and language requirements, makes our systems a "must have" in every community. Patrons at resorts, golf, tennis, theme parks and other recreational areas can enjoy the convenience of a callbox to place drink, lunch and sundries orders or to make dinner reservations at a clubhouse. Our "hands free" unit is the perfect communications solution for restaurants without drive up windows. This systems narrow frame and portability make placing a callbox in a strategic location or parking space for takeout orders a cinch. The potential for increased revenues and happier patrons makes procuring a Connectivity callbox system an easy choice! With our fully upgradeable expansive components, Connectivity's clients' can feel confident that their investment is protected. Our callbox line shows our devotion to simplicity, quality, and usefulness; and demonstrates Connectivity's strong commitment to providing for both our customers' present and future needs! » See wireless callbox features and benefits. » See wireless callbox product index.